The Tulip Run took place at the Skagit Regional Airport in Burlington on April 6th. Featured at this race was a 2 mile and a 10K course. It was the 25th race for the 2018/2019 Grand Prix schedule and the 6th for the 2019 Grand Prix schedule. To receive points for both series, Silver Striders were required to partake in the 10k. The 2 mile race included 262 runners/walkers. A total of 191 10k runners/walkers participated with 90 of them being Silver Striders (50+). That works out to be 47%. It is very apparent that Silver Striders have a large impact on the size of an event. This year the course was different from previous years. It was due to the loss of some of the trails when Paccar purchased land in the area. The terrain was nearly flat, with about 80% hard packed gravel trails and 20% rural roads. Aid stations were at 2.75 miles and 4.25 miles. Water and a sports drink were provided. This was a newly redesigned course and has been Silver Strider certified. Chip times will count for TOP IO recognition. To the surprise of most, the timing chip happened to be the prehistoric attach-to-the-shoe type. It took some of us old duffers a moment to remember how to attach it. Medals were given to the top three finishers in five year age divisions. At the start of the race the temperature was a cool 50 degrees with a light breeze. About 20 minutes into the run the rain began to fall. The wind picked up at times making it more difficult to keep your momentum forward. This course has an allure that can’t be denied, even without the view of the tulip fields. It was a very nice touch receiving a fresh cut tulip at the finish line. 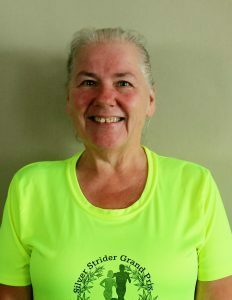 The first male Silver Strider to complete the 10K was Kent Sizer and the first female Silver Strider was Carol Montgomery. Post race refreshments included bread, muffins, animal crackers, goldfish crackers, potato chips, cake, cupcakes, oranges, and bananas. The Silver Striders gathered at The Farmhouse Restaurant for much needed nourishment. Laughter and good times shared by all. Leaving the restaurant the wind had increased. A wind advisory was in effect for the area, 20-35 mph wind with 40-55 mph gusts. We felt it wasn’t so bad running in the rain and mild wind. Just think about how bad it could have been! After the race, friends gathered at the Farmhouse Restaurant to celebrate. Patty Husko became the newest member of the Century Club. Congratulations Patty! We celebrated birthdays for Dennis Zaborac and Sandra Madden. Dennis had reason for a double celebration. He entered a new age group and became the 42nd Grand Prix finisher for the 2018-19 series. Many thanks to Race Director Dean Taylor for a memorable event.